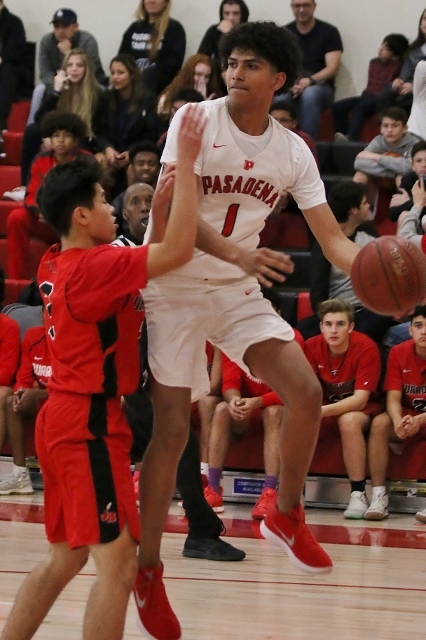 (Pasadena) – Pasadena went on a 27-6 blitz in the second quarter and never looked back in an 83-46 rout of Burroughs in Pacific League action Friday night at the Dog House in Pasadena. 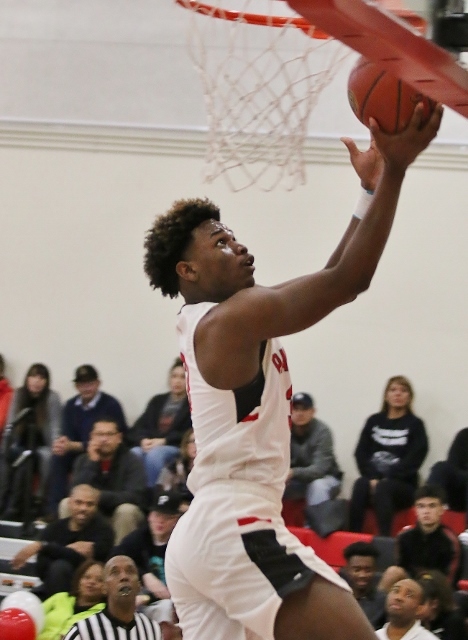 Burroughs was only down 15-10 after the first quarter but was shell shocked in the second as the Bulldogs hit them with a barrage of fast breaks and slam dunks. Darius Mason-Robertson, who had a pair of jams, scored six in the quarter and Lafayette Sanders had eight points down in the paint. Davian Brown and Brandon Lopez each knocked down threes during the run as Pasadena opened up a 42-16 halftime lead. Pasadena Head Coach Tony Brooks used the second half to work on a few things and empty his bench. the Bulldogs were up 65-28 after three and maintained that lead throughout the fourth quarter. Danny Pina had 16 points including nine in the third quarter and Mason-Robertson matched that with 16 of his own. Sanders finished with 13 and Brown buried three from beyond the arc for nine points. Danny Pina also scored 16 for the Bulldogs including nine in the third quarter. (Photo by Duane Barker). Brooks started all seniors including Mason-Robertson, Pina and Lopez as well as Javon Jones and Micha Coleman as Pasadena celebrated Senior Night. For Burroughs Emery Goulet scored 14 points and Nick Garcia added seven. Goulet hit four from long distance. With the win Pasadena wrapped up its 15th consecutive Pacific League title. The Bulldogs are 12-0 in league and 19-6 overall with just two regular season games to play. Burroughs fell to 4-8 and 11-14. 2 Comments to "Bulldogs Blow Out Burroughs"
Pasadena wrapped up their 15th consecutive Pacific league title with last night’s win. They play away at Burbank (Tue) and finish season at home vs Muir on Friday. CIF state all time records are not quite updated, as PHS was second all time with 11 consecutive league titles but this current streak is not mentioned. First all time was Mater Dei with 21 league titles in a row.